I never thought I would have a rant about fly swats, but here goes. 😉 Me? Procrastinating from doing other things? Never! 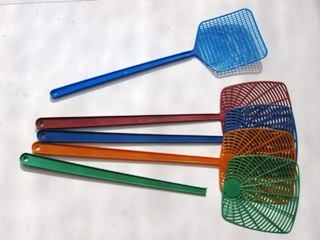 Recently our fly swat had been swatted a few too many times and was beginning to break. After many successful swats, I was in danger of my swatter falling to bits. This, of course, is an essential item in any Australian household. I checked in Coles, but it seems they no longer stock them. So over to the trusty bargain store. Four for $2! Bargain! Or perhaps not. Shopping in bargain stores can be somewhat hit and miss (excuse the pun!). Sometimes you get lucky and buy a reasonable item cheaply. Other times the item fails miserably and it is expensive at any price. And so it was with the fly swatters. A little thought about aspect of using a fly swatter is the flexibility of the handle. It seems that my old swatter had the right level of flex to flick through and catch the fly. However, the new bargain swatters (I was now the owner of four of them) did not. It seems that the handles were just too flexible. By the time the fly swat head had flicked through, the fly had moved on. Even adjusting my swatting action could not catch flies reliably. This is something that us mere mortals would not normally think about. And apparently something that the plastics factory in China did not think about either! Apparently the physics of the fly swat operation and required chemistry of the plastic are irrelevant at this price point. Ahh well. Better get back to work!